Omega X-33 officially released on 28th March 1998 at NASA owned Johnson Space Center ( Houston – Texas ). The R&D process is managed by formed NASA astronaut General Tom Stafford. The idea behind the creation of Omega X-33 concept is to compansate the lack of quartz and digital technologies on early generation Speedmaster models. Not entirely considered as a replacement for it's older brother Speedmaster, X-33 was still prone to shocks and vibrations ( MoonWatch was still good to perform flawlessly after a 5G shock but X-33 designed to resist shocks up to 3,5G ). On the other hand, the batteries inside X-33 had a risk of failure during high pressure. The LCD display's reliability was still not clear and quartz oscillator's frequency stability was another question. 1st Generation Seamaster Multifunction, ~1986. Though it looked like a totally new project, analog/digital combination watches were not that strange to Omega. Seamaster Multifunction which was in production since 1986 was miles away to perform what NASA required however it was still a good start for the project. The model name X-33 was first created as an Omega R&D Project code but after the watch has been officially produced Omega preferred to stick with the first code and named the model accordingly. X-33's P&R and advertisement campaign was quite a success story. Featuring several product placements arranged cleverly, the movie “ Mission To Mars “ is highly admired by science fiction movie audience and people who like hi-tec products granting Omega to introduce it's newest release in a very sophisticated way. Omega kept the contact with the past models while evolving X-33. Named after the legendary series at 1970s Flightmaster, X-33's re-newed design was a good example of retro support. X-33 Flightmaster 1996 shown below is sold for 16.350,00 CHF at the famous auction house for watches Antiquorum during the exclusive event Omegamania. Flightmaster X-33 was a highly engineered watch. Having slimmer hands styled in “wing” form in order to prevent lcd blocking, screw down chronograph pushers and never been used before bracelet design ( later this bracelet was used on Seamaster Professional 300 model aka The Bond Watch ) is still a very collectible watch for many watch enthusiasts. Surely you may think the name Flightmaster is a little odd for a watch which is designed to be working in outer space. Obviously it was not gonna fly out there. However, Soviet cosmonaut Aleksey Leonev had worn an Omega Flightmaster during his time in space for Apollo-Soyuz test project. Working on every single detail during the R&D process for X-33, Omega had the privilage to fully use NASA's all facilities. Having feedback from real professionals, Omega cleverly evaluated the information and used for refining X-33. User's comments were mostly focused on the inefficient size of the LCD display, lack of luminosity and glove wearing user compatibility. Actually it was not clear that the Seamaster Professional 300 type case and bezel is taken for prototype or regular production but it's obvious that the chrono pusher designs are highly effected by this in-house upgrade. Smp 300 Chronograph styled model had an option for an inverted LCD display which simply features bright digits over a dark background. The option soon discontinued as inverted LCD was not efficient enough for reading under hard conditions. Below is another prototype dates back to 1997 which was sold at Antiquorum “Omegamania” auction. As seen on the foto, the most important detail is the X-33 name written on the dial. 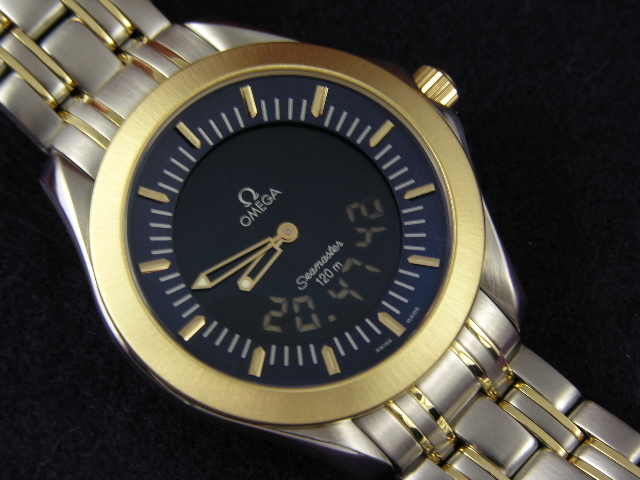 In summer of 2006, Omega officially announced the discontinuation of the model for public sales. Omega also stated that the sale to NASA members will continue as well as military pilots. Though Omega never officially declared the reasons behind it's discontinuation call, it was not long after the speculations and gossips took place among watch enthusiasts. There were some comments made sense such as X-33 model name's relation with the embarrassing failure of space programme X-33 effecting the sales negatively but never proven to be accurate. Also it's a fact that a watch retailing at 3400,00 USD featuring similar functions with Casio models priced at a fraction of what X-33 is listed for was weakening the sales. While struggling with the costs for X-33 Omega took another hit to it's hi-tec space watch. 80s's quartz crisis was over long ago and prestigious brands are routing back to traditional watch making for their top dollar models.X-33 was an expensive digital watch. Beside a few collectors, X-33 was considered as a bohemian designed quartz Speedmaster for most of watch enthusiasts. Back then watch aficionados did not like the idea of a quartz watch being called professional. For viewing pleasure X-33 lacked a lot. Simply designed LCD had nothing to offer style wise. The brushed surface designed to eliminate the reflections which may occur inefficient reading was also blocking the glamour of a high priced luxury time piece. Finally X-33 was not successful enough to carry on the legacy of the mighty Moon Watch. After a short(?) break, Omega answered all those assumptions with the lastest member of the X-33 family: Omega Speedmaster Spacemaster Z-33. Designed in the cult Helmet case form from the Flightmaster series, Z-33 had fair amount of resemblence to previous models. Soon after Z-33, Omega launched the newest offical X-33 watch: Speedmaster Skywalker. While making all loyal brabd fans pretty happy with the release, Omega shared it's own place in the world of professional quartz watches pioneered by Breitling Emergency II novadays.